Taking a four-month break after giving birth to her daughter in January, Ruby Lin (林心如) is back to work. Making an appearance at a jewelry event, Ruby spoke about life at home and how Wallace Huo (霍建華) he is a very supportive husband and involved father. Still carrying a bit of post-partum weight, Ruby said she has not tried to actively losing weight as she has been breastfeeding her daughter since birth. Having left her daughter’s side for three days in April due to work, Ruby was very anxious to rush home to see her daughter again. With husband Wallace Huo currently busy filming his new series, he has been reluctant to leave their daughter for work every day. Since Ruby is going to film her new series in May, she stressed the importance of coordinating her schedule with Wallace, so at least one of them is home to take care of their daughter in Taiwan. 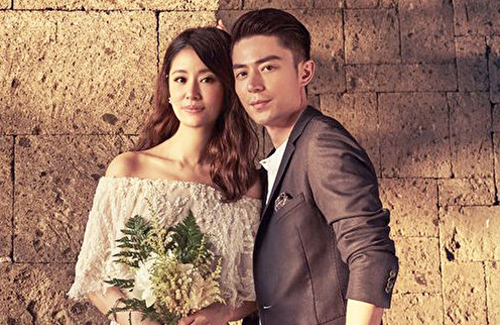 These days Ruby Lin is very hot, every one or two days she appears on news: her friend posts photo of her with youthful, bare face; she posts her pregnant tummy photo, her dating with WH photo, she livestreams herself, she attends flim promotion, product PR, etc … At the first two times she leaves her baby alone, netizens cricticise her and WH for only working, no-one takes care the baby, netizens wonder how they feed milk for baby, but after that, even 3 days letting the baby alone, no crictising news anymore, seeming like nobody cares anymore.